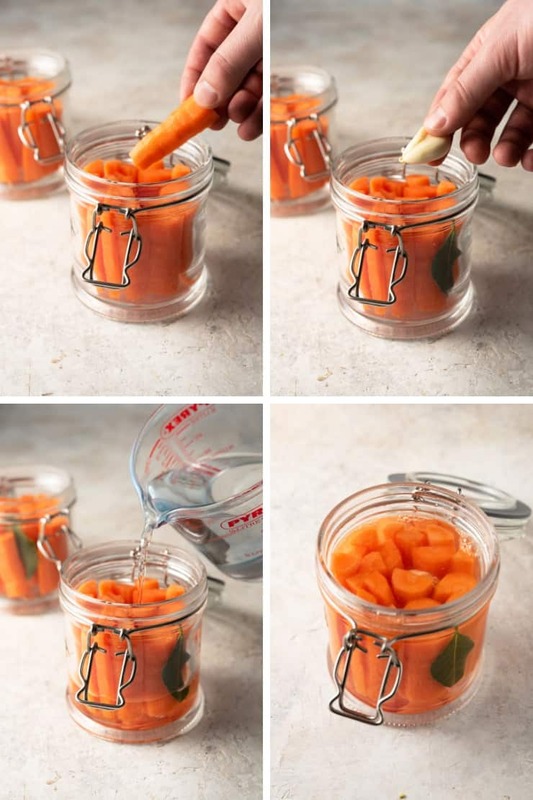 Delicious and easy Probiotic Fermented Carrots. Cultured and fermented foods are rich in probiotics, which are essential to gut health and proper immune function. Of all the fermented foods I’ve made, these carrots are one of the fastest and best tasting, plus they’re 75% cheaper than store bought! Most of us know that we should be eating probiotic rich foods daily. 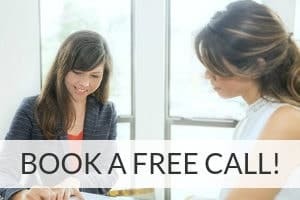 Research on gut health has exploded in recent years, linking probiotics to health benefits in more chronic conditions than ever before – depression, anxiety, eczema, food allergies, autism spectrum disorders, and obesity, not to mention the whole array of GI disturbances like chronic constipation, bloating, and diarrhea, just to name a few. My family has eaten yogurt and taken high potency probiotic supplements for years, and I still do rely on them and recommend them to provide a consistent daily dose of beneficial bacteria. 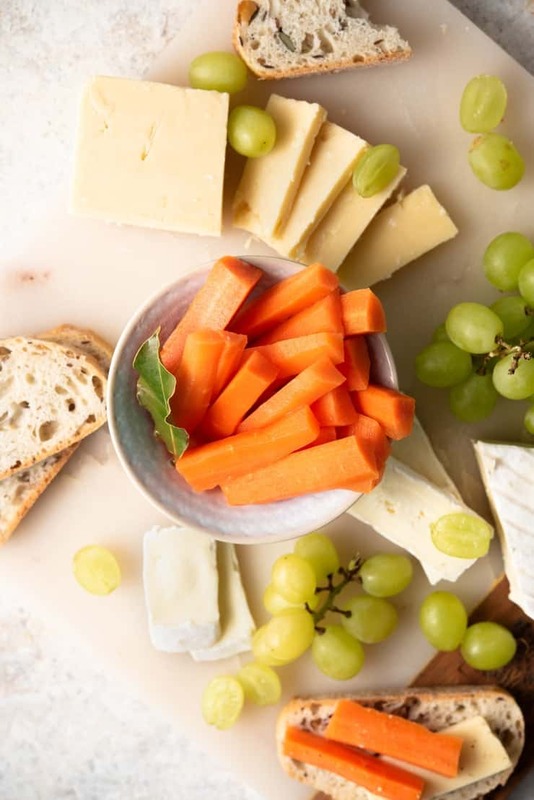 But last year my family and I began adding new-to-us cultured and lacto-fermented foods into our diets for an added boost of probiotics and the fibers that feed them. Foods like kefir, kombucha, traditionally prepared sourdough, and lacto-fermented vegetables are now staples in our home, and we’re loving it! 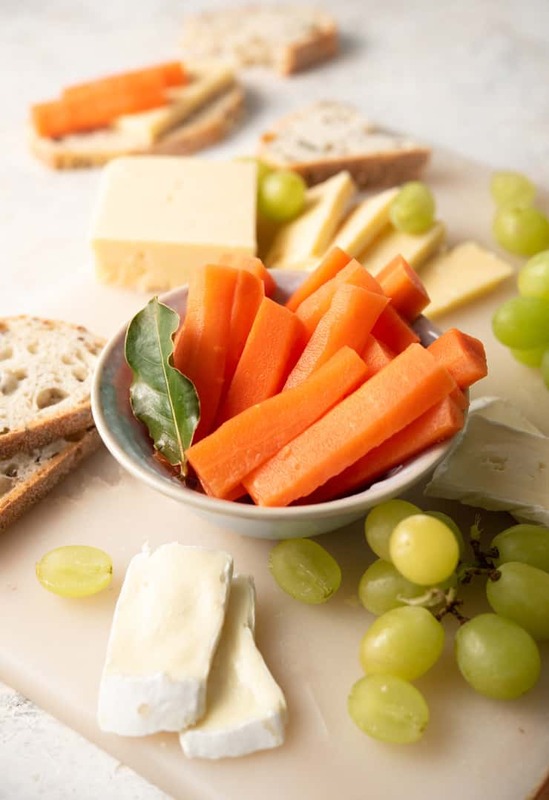 The kids especially love grabbing these fermented carrots for a quick snack! Heat the water and sea salt in a small sauce pan, stirring occasionally, until salt dissolves. Meanwhile, divide peeled and sliced carrots evenly between the two Mason jars – pack them tightly so they can’t easily move around. Place bay leaf, garlic (and any other seasonings) into the jars. Place the lids on the jars and store in a warm area of the kitchen for 3-7 days, “burping” (opening the lid to allow gas to escape) daily. The only problem with truly lacto-fermented foods is that they’re really hard to find at most grocery stores and, when you can find them (check the refrigerated section! ), they’re crazy expensive…like between $7 and $10 per jar! Fortunately, making them at home is super easy and is around 75% cheaper than store bought! 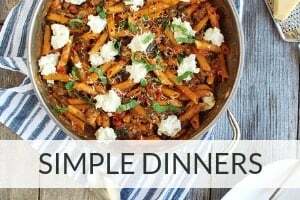 This recipe costs $2 or less, only takes 15-20 minutes to prep, and they ferment faster than other veggies, which I’m assuming is due to their natural sugar content that speeds the lacto-fermentation process. Plus, it’s so much fun to watch them bubble as they ferment! How Long Should I Leave Fermented Carrots for? I recommend leaving the carrots for 3-5 days before eating. The flavor will continue to develop after that, but I really prefer the flavor at the 3-5 day mark. Once they’re finished fermenting, they’ll also store really well in the fridge for weeks! 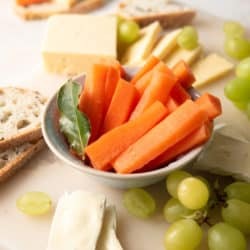 These fermented carrots are a great addition to salad and sandwiches or can be served with dips or as part of a delicious cheeseboard with fruit, preserves, olives and crackers. The great thing about this recipe is that it’s so easy to adapt with different flavors so why not try experimenting! Other seasonings that would work really well are fresh ginger, turmeric, chili peppers, peppercorns, and dill or other fresh herbs. Make sure to open the jars occasionally during the first 3 days to let the gas escape. I like to smash the garlic with the back of a knife so it’s split slightly but still whole. It gives a much stronger garlic flavor which I love but if you prefer you can add the garlic whole as it is for a more mellow flavor. Place the jars in a warm area but not hot and not in direct heat. After 3-5 days you can store the carrots in the fridge for several weeks. These are great for gifting – tie the jars with a pretty ribbon and and give them out to your foodie friends! These easy probiotic fermented carrots are one of the fastest and best tasting, plus they’re 75% cheaper than store bought! Meanwhile, divide peeled and sliced carrots evenly between the two Mason jars - pack them tightly so they can't easily move around. Place the lids on the jars and store in a warm area of the kitchen for 3-7 days, "burping" (opening the lid to allow gas to escape) daily. We like the flavor after just 3-5 days, but you can adjust the time to your liking. Store fermented carrots in the fridge (no need to burp once fermentation is complete). Make sure to open the jars over the first 3 days to let the gas escape. I like to smash the garlic with the back of a knife so it's split slightly but still whole. It gives a much stronger garlic flavor which I love but if you prefer you can add the garlic whole as it is for a more mellow flavor. After 3-5 days you can store the carrots in the fridge for up to one year. I am diabetic-does fermentation significantly lower the carbs in the carrots? Fermentation definitely lowers the total carbs, and the longer you ferment, the more of the carbs will be converted to lactic acid. Still, it’s hard to estimate remaining carb content. I hope that helps! My mom used to make pickled carrots. I bet these would taste similar. What a great way to enjoy carrots. Maybe I can finally convince my daughtr to eat them…she does love garlic!! This is really interesting. I’ve never heard of lacto-fermented food products. I’ll have to look into this a little more! I am super excited to see how more and more focus is put on probiotics. I do believe they are essential in our day-to-day meals so having this carrot recipe handy is just as important as knowing the theory – thank you! I’ve had pickled carrots but ever fermented and definitely not probiotics. Very interesting. Love how simple and easy this is. I can’t wait to try this. What a delicious and fun way to eat probiotic rich foods daily. My kid loves snacking raw carrots and I so curious to see if he will love these! I have heard how good fermented foods are for you but have never tried! I love that making them yourself is so much cheaper – def worth a try! Me and my children are extremely fond of this quick cooking of carrots. We eat it with pleasure, because it’s easy to cook. What a great idea and I love that the fermentation lowers the carbs in carrots. I have to give these a try soon! Mmm is an interesting recipe for this carrot. Great idea for a snack. Quick and easy. I like. Thank you for sharing this great recipe! Hmmmm!! I don’t eat fermented foods unless you consider sauerkraut fermented and I don’t eat it that often. I’m going to have to look into this. I’m all for eating better and having a healthy tummy. I may just start with the carrots. 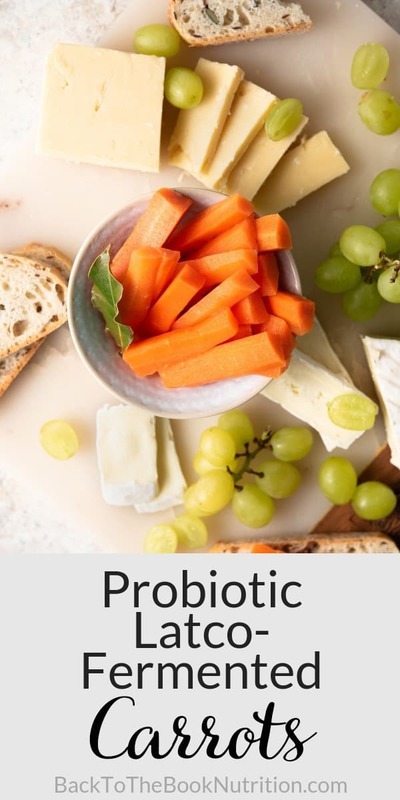 I have been looking for homemade probiotic recipes and this one sounds right up my alley. It sounds easy to make with ingredients that I always have on hand. Thank you for sharing. Thank for sharing your knowledge of fermented foods. I really enjoy eating them and Its nice to know they have some true benefits for overall health. Sure, Dianna. Thanks for your comment! I let my fermenting carrots go for about 1-2 months accidentally. They have airlock lids and it’s been cold, but I did move them closer to the fireplace. There is no visible mold, (only white sediment on the bottom) and they smell fine. Are they okay to eat? I tasted a bite of one, it was a little sour, but I’m guessing that’s because of the added fermenting time? Just don’t want to get sick from them. They are in the refrigerator now.